This was how one of the women in today’s focus group explained to me why what we have been calling the Talk Circle would be so important. 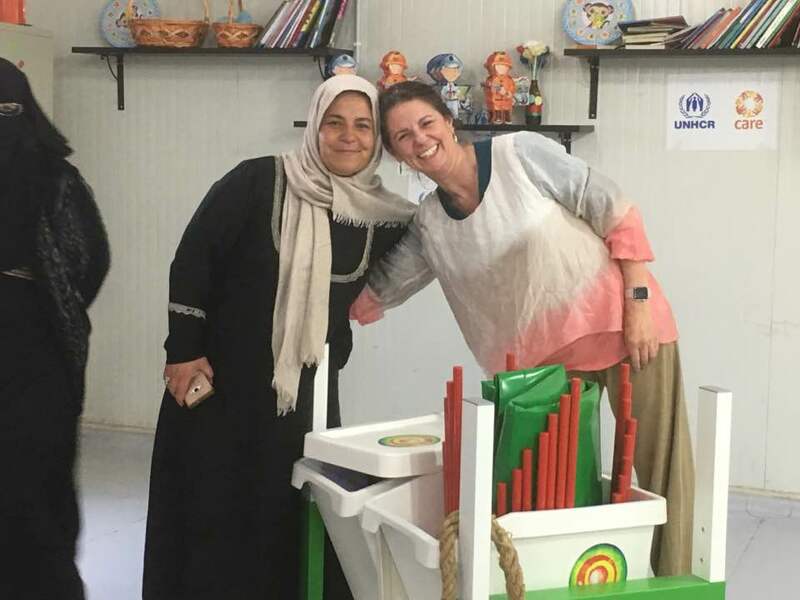 When we wheeled our Professor Branestawm style trolley into the community centre at the camp this afternoon, with traditional Syrian music playing from the hidden speaker, a ripple of excitement went around the room. Then we explained the story to them. How I had been struck on my first visit by the isolation of the women evidenced by the wellbeing survey from our impact research when we found that 60% hadn’t seen anybody the day before except the family members living in their shelter. This number was much lower for the men, I explained to the women. Of course, they told me. Because the women are at home with the babies and children, at home with the old people and the sick people, or afraid to go out, or not allowed to go out. They were touched that I had left the camp in 2015 determined to think of a way of helping them. It has taken longer than I expected to overcome some of the hurdles but today it felt like the idea came into the world – kicking and screaming! They loved it when we explained that the inspiration for the trolley was some of the ways we had seen children transporting water from the tap to the houses. Hey! they exclaimed when they saw it – a giant water carrier! The focus group was the idea of Malek and Jameel, the managers we work with on the camp. We had met with them earlier in the day when we first arrived and were delighted to be greeted like long lost family. The whole camp looks different to our first visit in July 2015. There are now 4 villages open (2 in 2015) as the tide of refugees from Syria continues. The vocational training centres and the marketplaces are open after long delicate negotiations by DfiD and CARE regarding the concern about economically active refugees in a country already struggling with low employment. There were more people around and more colour as other projects and individuals have been inspired to paint their houses too. Malek and Jameel have been working here since the camp opened and still show an impressive level of enthusiasm and what I can only describe as love for the refugees and for progress. They talked about the concept of creating positive refugees rather than passive ones. That camps, originally set up to save lives, can end up slowly sucking the life out of people if this approach is not followed. They are always on the look out for ways of empowering the refugees and helping them build resilience. They gave a couple of unexpected examples: a fashion show they recently had at the community centre where refugees had shared skills and designed and made the clothes themselves. The collection included wedding dresses which can be borrowed by the refugees should the occasion arise. The second example was a refugee rapper (a relatively unusual artform in Syria) who recorded a 16 second burst of his work which they now use as the ‘call waiting’ music on their switchboard, thereby honouring the man’s skills and walking the talk – seeing the refugees as people with skills and stories in difficult straits rather than helpless victims. And so a couple of hours later I found myself in the room with about 15 of the women running a focus group. They all wore headscarves, some with only the narrowest of eye slits. They were guarded, only the bolder ones risking a small smile of welcome. With a member of CARE staff acting as translator I explained the idea and the reasons behind it. At first their questions showed they were thinking it was my idea that I had come to implement. But they soon realised that us envisioning and creating the Talk Circle trolley was only the beginning of the idea. And that bringing it to life involved them at least as much as it involved me. As time wore on they got more animated. Especially when Patricio interrupted to ask how they would stop the men taking over the Talk Circle and the equipment. Fingers stabbed the air, voices were raised; they were adamant that this was not going to happen. It’s easy, they declared. The men won’t take it over because we won’t let them. The first time I visited the camp I was reflecting on the situation of the women here and how it might, despite the terrible reasons it had happened, also be an opportunity for them. In the same way that the disruption of WWI allowed women to experience working, driving, even playing football changed everything. And the disruption of war in this case means that women are exposed to ways of doing things that they might not have encountered in a traditional or rural community where their role would often have been to stay in the home caring for the family – the invisible work of women the world over. Here they see women working, foreign women dressing differently, women taking up opportunities alongside men. I saw the younger women in particular watching me. Thinking. I remembered this today when Malek and Jameel were talking about how much the women are enjoying the chance to work outside the home (shelter). After sewing classes they decided to make school uniforms – they will need 20,000 if each child is to have one uniform, and they have made hundreds already. This is the kind of social change which could have a lasting and wide reaching impact. So, back to the focus group. After a slightly hesitant start the women got very into the whole idea. We could take it to the marketplace! cried one. What about the health clinic where we are waiting with our sick children? We could be learning about health while we wait or listen to children’s stories. Then they started thinking about what material they could generate for themselves – old people telling traditional stories suggested one. No, young people who look to the future and know more things countered another. They started to debate among themselves – always a sure sign that a focus group is working. A cookery program. Interviews with women who have started a training course. A talent competition. Informal educational content for the children when they are not in school (there are schools here but they have a shift system, boys in the morning and girls in the afternoon). Bedtime stories. Capturing the women’s personal stories. The ideas came thick and fast. I felt the Talk Circle lift off the ground and be carried by these energised, warm-hearted women. I could see their eyes smiling through the gap in their veils. You brought us connection, they declared. You brought us joy. You have inspired us to do this for each other. I couldn’t have scripted a better response. It was beyond perfect. Beyond my wildest dreams of how well this could go. Then one had the idea of a selfie by the machine. ‘Facebook face!’ they shouted. I was hauled in to be in the picture too which triggered a whole flurry of selfies – then one of them unpinned her veil so her smile showed on the photo which meant they all had to be taken again like that. Their enthusiasm was infectious. Tomorrow we will have several teams. 4 of them will come with me to wheel the machine to different locations – mostly between the shelters but also maybe the marketplace and the water tap. We will play some music and episode 1 of the soap opera. Another team will be re-purposing the Changemaker t-shirts we brought with us into an item the women can easily wear to signal their role. A creative team will start to find new material – some of the things they thought about today plus whatever emerges as they continue to co-create the concept. I always thought I should keep quiet about my real purpose with this project. Of course it is about improving their day to day lived experience. It is about a moment of joy. And then it is a vehicle for creating connections, building resilience and ultimately empowering the women. I had assumed that the Talk Circle would start life looking like light entertainment and end as enlightenment. But today one of the women said jubilantly ‘ We are starting a revolution here’. They got it. They can sense what could happen here. The more I empowered them during the conversation (it’s your thing not my thing) the more the project became about their own empowerment and how the machine will support it. Artmongering with Refugees: Chapter Two from Matt Allen on Vimeo.